No book about the Pacific Crest Trail’s amazing history would be complete without vivid photography. The PCT is about beautiful landscapes, among other things. In this new Pacific Crest Trail book, explore an in-depth history of the trail and more than 250 photographs that bring the trail experience to life in large, living color. 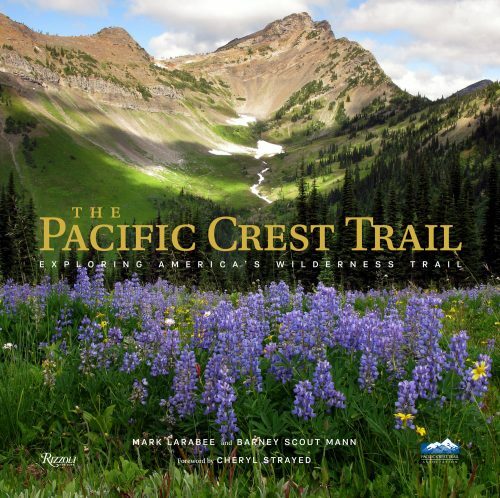 Buy your copy of our Pacific Crest Trail book at shop.pcta.org, Amazon or Barnes & Noble! The Pacific Crest Trail: Exploring America’s Wilderness Trail, published by the Pacific Crest Trail Association and Rizzoli New York, was released Oct. 11. Mark Larabee, the PCTA’s associate director of communications and marketing and Barney Scout Mann, former PCTA board member, tell how this 2,650-mile trail from Mexico to Canada came to be. It’s a tale about the dedication of many volunteers and government land managers, as well as political will and just plain luck. Buy our PCT book today. You’ll love it. The Pacific Crest Trail: Exploring America’s Wilderness Trail is truly special. Cheryl Strayed, author of the best-selling Wild: From Lost to Found on the Pacific Crest Trail, wrote the foreword. She introduces a gripping saga of how the trail came about—from a New York boxing ring where a future Chief of the Forest Service decks a future U.S. President to trail visionary Warren Rogers who chose between keeping the family home or lobbying for the PCT. This coffee-table-sized Pacific Crest Trail book celebrates the West Coast’s most iconic hiking and horseback riding trail. It includes rarely seen archival images. The book’s back-end photo gallery sets you on the ground as if you were there, walking you through 48 wilderness areas. Interviews from a 5,000-mile road trip intimately introduce you to today’s PCT champions. These volunteers give their own time and treasure to keep the trail open for complete strangers to enjoy. Their dedication is the lifeblood of the trail going back to the 1930s. They carry the torch with same fighting spirit that created and keeps the PCT idea alive. The stories are detailed and personal. Read how the wife of a president influenced the outcome of the debate over naming the PCT one of the nation’s first two National Scenic Trails. Learn the definition of dedication when a PCTA volunteer’s two horses fall off the side of a mountain during a trail project. Feel the urgency as the PCTA’s first paid staffers chose which bills to pay to keep the struggling nonprofit from closing its doors. It’s all in there, surrounded by the scenery that remains a driving force for thousands of PCTA members and volunteers. This Pacific Crest Trail book includes a map folded into the inside back cover pocket. It is photo- and information-packed and is an inspirational bucket list for everyone who wants to get out on the trail—from day-hiker to thru-hiker. Buy your copy of The Pacific Crest Trail: Exploring America’s Wilderness Trail at shop.pcta.org, Amazon or Barnes & Noble! The Pacific Crest Trail: Exploring America’s Wilderness Trail is the third book in the bestselling trail series by Rizzoli. It follows the 2013 National Outdoor Book Award winner, The Appalachian Trail, and New York Times bestseller America’s Great Hiking Trails. Whether you’re passionate about the PCT, looking for a beautiful coffee table book or buying it as a gift, our book is sold at many local book stores, and most places online. Buy the book in our store at shop.pcta.org. Buy it on Amazon – please leave a review! It helps. Mark Larabee has worked for the PCTA since 2010. A Pulitzer Prize–winning journalist, he spent twenty-five years as a newspaper reporter and editor. In 2005, he spent four months researching a 13-part series about the Pacific Crest Trail for The Oregonian newspaper in Portland, Oregon. Barney Scout Mann is a freelance writer whose articles have appeared in Backpacker, The Oregonian, and the PCT Communicator. He served as chair of the Pacific Crest Trail Association’s board of directors from 2012 to 2015. His first hike on the PCT was in 1965, and he thru-hiked the PCT in 2007. Cheryl Strayed is the author of the No. 1 New York Times best-selling memoir Wild.